Emotional Intelligence: What Makes Business Leaders Stand Out From the Crowd? What makes a great business leader? Without a doubt, many would say: Well, it’s this extraordinary combination of intelligence, advanced university degrees, technical expertise and inspiring vision. We tend to give this answer intuitively, regardless of whether we’re thinking of huge multinational financial-services companies, local real-estate developers or small high-tech start-ups. And that’s understandable. But if all these skills, educational background and outstanding job experience are must-have items on the CV of any prospective CEO, why do so many bosses around the world eventually fail in their careers? In fact, the missing ingredient – very often overlooked, yet crucial for success as a business leader – is emotional intelligence (EQ), or the ability to understand and manage emotions, both your own and those of others. In other words, knowing what you’re feeling, what your emotions mean, and how your words and actions affect other people. 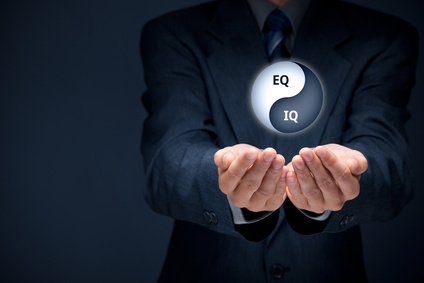 Why emotional intelligence is crucial for business leaders? Of course, all people experience emotions, but only a few can accurately identify them as they occur. Many individuals try to shut off their feelings, but as much as they distort, deny, and bury their emotions, they can’t ever eliminate them altogether. Unlabelled emotions often go misunderstood, leading to irrational choices and counterproductive actions. To be flexible and open to change, good leaders must be self-aware and understand their feelings. It is also crucial for them to be conscious of how their verbal and non-verbal communication can affect other people, as this will have an impact – either positive or negative – on their ability to inspire and lead their teams. But self-awareness is only part of the EQ phenomenon, and a good starting point for a boss keen to improve their management skills. Much of emotional intelligence, however, comes down to social awareness, or the ability to read other people, know what they’re about and understand what they’re going through. A leader lacking in emotional intelligence won’t be able to gauge the needs, wants and expectations of those they lead. Psychologist and author Daniel Goleman, who first brought the term “emotional intelligence” to a wide audience with his 1995 book by the same name, argued that non-cognitive skills can matter as much as IQ for workplace success. In his research, Goleman found that 80-90% of the competencies that differentiate top performers are in the domain of emotional intelligence. “Without it, a person can have the best training in the world, an incisive, analytical mind, and an endless supply of smart ideas, but he still won’t make a great leader,” Goleman wrote. Just to make the message clear to those still downplaying emotional intelligence as a “touchy-feely” soft skill: It’s not that a business leader’s IQ and technical skills are of lesser importance to their job. They do matter; the point is that they’re just minimum requirements for top corporate positions. And the higher up the leadership ladder you go, the more vital your emotional intelligence skills become. EQ increases corporate performance for a number of reasons. Leaders with high emotional intelligence are more likely to make smarter decisions, engage and influence more effectively, and create the right mood for the job. But perhaps most important is managers’ ability to inspire discretionary effort: the extent to which employees and team members go above and beyond the call of duty. Individuals tend to be more willing to go the extra mile when asked by an empathetic person they respect and admire. Decades of scientific research have provided clear evidence that emotionally intelligent leaders are more successful. Many of these studies yield bottom-line results. For example, at US-based food and beverage giant PepsiCo, executives selected for EQ competencies generated 10% more productivity; high EQ salespeople at French cosmetics company L’Oreal brought in $91,000 each in additional revenue each year, for a combined annual total of $2.6 million; and an EQ initiative at international hotel chain Sheraton helped increase market share 24%, according to The Business Case for Emotional Intelligence, a report published by Six Seconds EQ Network. Another study mentioned in the report tested 186 executives on EQ and compared their scores with their company’s profitability: Leaders who scored higher in key aspects of emotional intelligence (including empathy and self-awareness) were more likely to be highly profitable. Emotional intelligence is a powerful tool for improving work relationships and creating a healthy work environment and organizational culture. To be effective, leaders must have a solid understanding of how their emotions and actions affect the people around them. It’s worth taking the time to work on self-awareness, self-control, social awareness, and relationship management to be able to exceed your goals and achieve greater career success. At IMSA we understand that finding the best candidate for a managerial / executive position is not only about finding the person with the perfect fit of “hard skills” to customer’s requirements. Throughout the whole executive search process we put equal emphasis on verifying, if the candidate has the specific knowledge required for the job, but at the same time we focus also on emotional intelligence assessment. Proper combination of the two components is essential for later success of both: our candidate working as a leader, and of our customer.